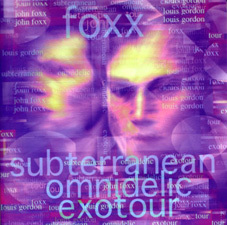 The Subterranean Omnidelic Exotour was recorded during rehersals for John Foxx and Louis Gordon's 1997 tour. Only 1,000 copies of this five-track EP were produced, and it features contemporary reworkings of tracks from Metamatic, Shifting City and Systems of Romance. The EP soon sold out and an expanded version was issued the following year.